In the framework of the initiatives that Novamont has undertaken in the field of scientific communication and to promote sustainable production and consumption patterns, we are pleased to present the new website www.bioeconomythinking.com, dedicated to the dissemination of relevant initiatives in the field of bioeconomy, with a particular focus on the second edition of the Handbook of Biodegradable Polymers. ​Edited by Catia Bastioli, CEO of Novamont, and published by Smithers Rapra, a global leader in consulting and training services in the rubber, plastics and polymers sectors and an authoritative publisher in these fields, the volume explores the latest developments and the potential of biodegradable plastics, considered - as confirmed by the most recent European regulations - a fundamental component of the circular economy. Ten years after its first edition, the Handbook, which is a collection of contributions from renowned experts from internationally acclaimed research centres (such as the University of Wageningen, the Organic Waste System, the Fraunhofer Institut and Michigan State University, to name but a few) analyses case studies that show how these materials provide an effective solution in difficult or uneconomical recycling conditions or in cases where traditional plastics would risk contaminating the natural environment or the organic waste fraction. Moreover, the volume also provides an overview of the main biodegradable polymers of both renewable and non-renewable origin, describes their sectors of application and the market, tackles the subject of integrated biorefineries and recalls the legislative and financing initiatives undertaken over the years to promote the EU’s capacity for innovation in the sector. 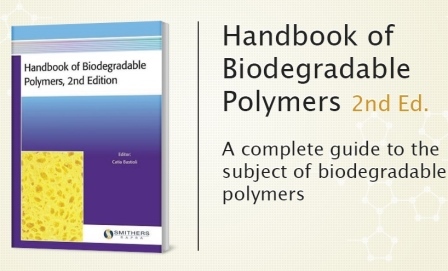 The market data and scientific evidence set out in the Handbook of Biodegradable Polymers confirm not only the increasing popularity of these materials – whose properties, performance and biodegradability characteristics enable them to be used in a range of innovative and low-impact solutions, redesigning whole sectors of application – but also the need for their development, use and disposal to be dictated by a veritable change in mindset inspired by the bioeconomy and the circular economy.